While oven is preheating Line 2 baking sheets with tin foil and spray with cooking spray (I like coconut oil spray). On one tray place the chopped veggies and on the other place the salmon skin side down. In a sauce pan, combine 1 cup of farro with 2 cups of water. Bring to a boil and then let simmer for 20-25 minutes or until the liquid has dissipated. While the farro is cooking, combine the avocado and greek yogurt into a small mixing dish. Combine until well mixed and set aside. When the farro is cooked, add the golden raisins while it is still in the saucepan, let sit until ready to plate. Remove the fish and veggies from the oven. 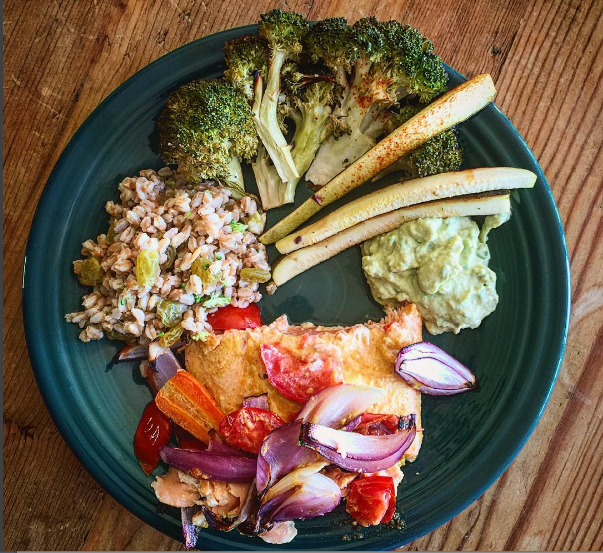 Plate the farro and place salmon and veggies on the side. Dollop the greek yogurt and avocado mix aside and enjoy! Forget Greens... Go with RED! What if red smoothies actually make you lose weight faster? It's pretty bizarre, but it'll all make sense once you find out what's in this special red smoothie.